I’ve tried all sorts of things, from absorbent pads, to simply sucking it out with a high volume pump, and disposing of it appropriately. 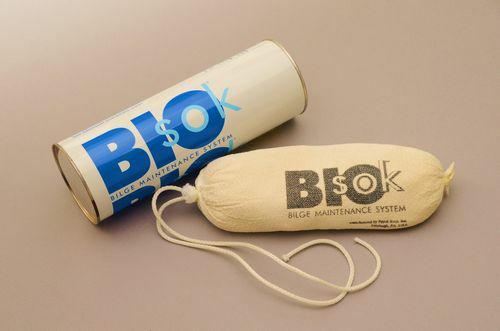 Nothing seems to work that well, at least not until I found BioSok. It’s some sort of powdery looking chemical that reacts to oil and fuel, and pulls it into it, then uses some microbes to eat off the oil. I ended up buying two of the cloth socks, and one small bin of powder. I used the powder directly throughout the bilge on the surface to get the oil that had been in there for a while since the repower. I have the socks standing by to be used once the initial cleaning is done. So far, the powder has been in the bilge about a month, and it has turned a nasty dark brown color. I don’t see any oil in the water, or on any other surfaces of the bilge, which is good. I guess that means it’s doing it’s thing. At this point, I think I leave it for a while so the microbes can eat, or I could dispose of it appropriately somewhere. The stuff is the consistency of chocolate fudge – I’m sure it doesn’t taste as good though. I’m hoping in a few weeks things will dissipate more, and if not, I’ll clean it all out. At that point, I’ll drop one of those socks into the bilge in case there’s any other problems during the season. So far, these things look pretty convenient, and environmentally friendly.